Product Dimensions: 25" back width x 14" total depth. Clears 3" under crossbar. Building a proper fire in your fireplace is an art; it takes the right combination of fuel, heat, and air flow to get wood to burn. With this 27-inch standard fireplace grate you will have 3 inches of clearance below the crossbar to allow plenty of air circulation. Diamond section 3/4" solid-steel bars provide a secure base and curve upwards in back and front to keep your logs from shifting. Your fire will burn hotter and more efficiently with this heavy-duty grate. It is tapered to 25 inches in back width, and has a total depth of 14 inches. 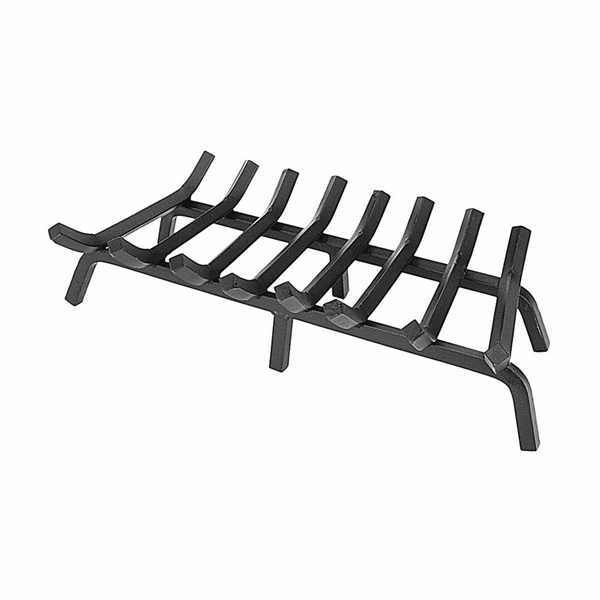 How many bars does this Minuteman 27" standard fireplace grate - FG6-27C have? The manufacturer did confirm that this grate does feature 8 cross bars as shown in the photo from the website. This product was just as described and for a good price. I am satisfied with my purchase. This new grate is exactly what we were needing. It?s the perfect steel gauge, and we love the extra legs that keep the grate from sagging in the middle part. So far, it?s working very well, and we are very pleased with this grate overall. My new grate was delivered extremely quickly, and in great condition too. Everything was great! I used it at once in my fireplace outside, and the results were outstanding. I can start fires quickly and easily. I would most definitely recommend this grate to those who need a superior quality grate. I?m very satisfied, and I believe you will be too. I had been searching for a grate that would fit my big fireplace. This one is the perfect size, and I was able to get it for a great price. So far, I've used this grate just a few times, but I do believe that it will definitely hold up for many years in the future. This grate is the perfect size for my large fireplace. It's well made and should last a long time. I purchased this unit for a lot more money at a brick and mortar store several years back. It has worked very well so far, and I would recommend it to others. This is a heavy duty fireplace grate, and I think it's going to last us for a very, very long time. I highly recommend this product to others. This is a wonderful fireplace grate, and I believe that it will last for many years to come. I was, however, slightly disappointed when it was delivered. I had been looking for a square shaped bar stock, and this one is more of a diamond shaped bar stock. It still looks really nice though, and it?s not a deal breaker for sure. Just note that it isn?t the bar stock that is shown online in the photograph. I?m going to keep it because of its amazing quality, and the price that I paid is unmatched online by competitors. This grate is made to last! I?m so happy with my purchase. It?s even better than I thought it would be. It?s well made, heavy and sturdy, and I figure it will last for a very long time. I?m very pleased with this grate! This fireplace grate is made from high quality, thick metal, and was absolutely what I was wanting. I thought this grate would be a bit bigger and more curved, but for now, it will definitely do just fine. I was hoping that this grate would be taller. I currently have a log lighter, and this grate just about sits right on top of it. It?s very strong though, and I don?t think I?ll have any problems with its durability or longevity. This piece features a flawless design, and is really a good looking, heavy duty unit. I would definitely recommend this to those who need a great quality grate. This is a heavy duty grate, and we have been using it now for around two months. We live in Florida, and the temperature can fluctuate quickly, and it can get cold fast. This grate doesn?t sag or yet show any signs of wear and tear. Some paint has peeled off from the high temperatures, but other than that, it looks great. It adds some draft protection that we didn?t get with our old OEM grate. If you are to purchase this item, which we highly recommend that you do, you will certainly love how durable and high quality is really is. I received my grate a few days ago, and although it seems to be quite lovely, it isn?t the grate pictured online. The bars online are square, but this grate has diamond bars. This is a pretty good grate, but if you burn plenty of fires, I don?t think this particular grate will last. My grate has already started to warp. I?m a little disappointed. We have recently bought a new fireplace that came with an insert. The grate that was included with our purchase is pretty terrible. It sits very close to the bottom, and doesn?t allow for any air movement, which is disappointing. It was expensive, and I thought it would have been better. That?s where this grate comes in. We purchased it to replace the other one, and this new one works fantastically. It has held strong even with some really hot fires. I?m very pleased. This is a heavy duty piece that works great. It is a little bit too high, but I think I can cut it down to size. I?m pretty pleased with it.